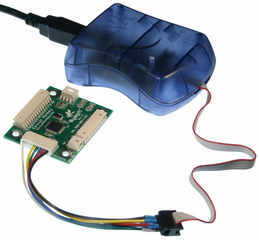 This cable harness lets you connect a programmer like the Atmel MKII 6-pin header connector to the Nymph board for chip programming. Pre-terminated with a Molex 51004-0800 at one and and then terminated to a male 6-pin header. See the photo for typical hookup.